The Pearl Mermaid Norns Version 2.0! You'd think they're the same, and yet so much has changed! 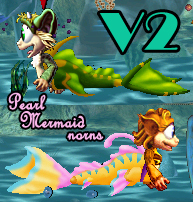 The Pearl Mermaids are an amphibious breed. The babies are born with legs and only grow a mermaid tail later in life. NOTE: Because of the trick used to make the mermaid tail possible, their atts have been modified quite a bit, and they may not crossbreed well with other breeds. Special thanks to Norngirl for in-game testing and Razgriz for genetics. Yes they can, they are amphibious. I'm sorry to hear that firefox... Make sure you put the image files in the image folder, if they are not in the right folder the game won't load them properly. Hope it helps. The default norns indeed have the same diet as a normal norn. The Colortrue variety has instincts to eat critters and such, however. I don't suppose they eat critters, do they? I've got crobsters and shrimpton and the like for their protein but they tend to ignore them. The files have now been swapped by Rascii! I tested it post-uploading to make sure the problem didn't slip in again. I aged a couple up with targ norn ages 4 and my game didn't crash. In fact, i looked away for a moment and when i returned, the female was happily laying her second egg. The current version has a game crashing glitch. The fixed version should be uploaded soon, we'll let everybody know once it's up.